Dollingstown manager Stephen Uprichard. Pic by PressEye Ltd. The season for Dollingstown and Portstewart is set to extend into the closing days of May - but with the ultimate reward of promotion the prize. The demanding campaign to date has featured domestic glory for both clubs across the, respective, Mid-Ulster and Northern Ireland Intermediate leagues. Now Irish League destiny will be defined by two dates for a place back in the third-tier division over successive Saturdays on May 20 and 27. Home advantage at Planters Park could prove key for Dollingstown this weekend before the trip to Seahaven. “The first leg at our own ground will take on even more significance as it offers us a chance to gain an edge and grab the upper hand,” said Dollingstown manager Stephen Uprichard. “The lads have been superb all season so now it is about that final focus. “The players face a different challenge now and some of the lads have experience of the previous Irish League promotion play-off. 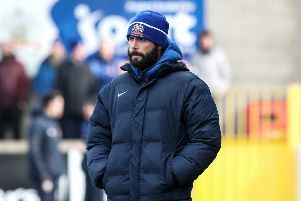 “It is about going in as relaxed and prepared as possible and we have had Portstewart scouted so know to expect a strong side in the middle of some great form.